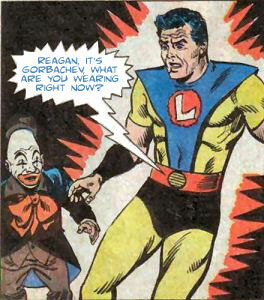 ajw: Reagan, it’s Gorbachev, what are you wearing right now? Joshua: With my ventriloquism powers, I shall seduce this clown! von Bek: Electrifying chasity belt active! Step away from the clown! And the winner of either any item they like to be included in HM3 or their own Sketch of the Day style illustration is ... ajw, with his first Caption or Character Design victory! I like that he noticed a resemblance that had completely escaped me, and I love the idea that Reagan and Gorbachev routinely engaged in telephonic cosplay. That's probably why the Soviet Union collapsed. Congratulations to AJW and all our Finalists! 9 Responses to Caption Contest 101 Winners! That still has me chuckling. Well done AJW! Nice one ajw. I liked that one too. Congrats. Wow! thanks jeff my first caption win! I’ve been running errands, what a surprise. Ha! My first finals! Congrats to AJW.